This section will discuss two propulsion systems that operate in a manner different from conventional airbreathing chemical combustion systems. 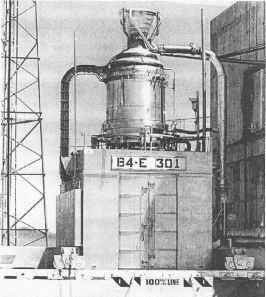 The first originated in the former Soviet Union, probably in the 1970s, as a total energy concept that coupled aerodynamic forces with electromagnetic forces and required a local plasma flow to exist for the system to work. The Russian name for the system is "Ayaks", or Ajax, and is described as a magneto-hydro-dynamic (MHD) energy bypass system. If the flow inside (or even around) the aircraft is sufficiently ionized, i.e. a plasma, then the MHD system equivalent to an induction generator can remove energy (velocity) from the flow as an electrical current, with minimal aerodynamic diffusion [Tretyakov, 1995]. This reduces the energy lost through the shock waves in conventional inlet aerodynamic deceleration. If that electrical power is transmitted to the equivalent of an induction motor (a Lorentz force accelerator) then electromagnetic interaction with the plasma can add energy (velocity) back to the flow. The motivation for the MHD system is the realization that the electromagnetic energy transfer suffers less of an entropy rise (irreversible energy loss) than aerodynamic diffusion and expansion, so the net thrust is greater. If the flow field around the aircraft is a plasma, flow [Gorelov et al., 1995] energy can be removed at the nose by an MHD generator that alters the shock wave structure around the vehicle, reducing the total drag [Batenin et al, 1997]. Again, because the flow is ionized, the flow in the propulsion inlet system can be turned by MHD Lorentz forces instead of physical inlet ramps (a form of morphing). That may dramatically reduce the weight and mechanical complexity of the inlet/nozzle system. In this chapter the focus is on the energy bypass system. The second is creating heated air to produce thrust not by combustion, but by the interaction of the air and intense electromagnetic radiation (either by a LASER or by a microwave beam). The advantage is that only some working fluid to produce thrust is needed (usually water), which can be dense when stored and produce a low-molecular-weight gas when heated. It needs not to be combustible. Since the energy source is remote from the vehicle, a directed energy beam (on Earth, the Moon, a space station or wherever) must provide the power to the vehicle to produce thrust. This vehicle is termed the "Lightcraft" by its inventor, Professor Leik Myarbo of Rennselaer Polytechnic Institute.